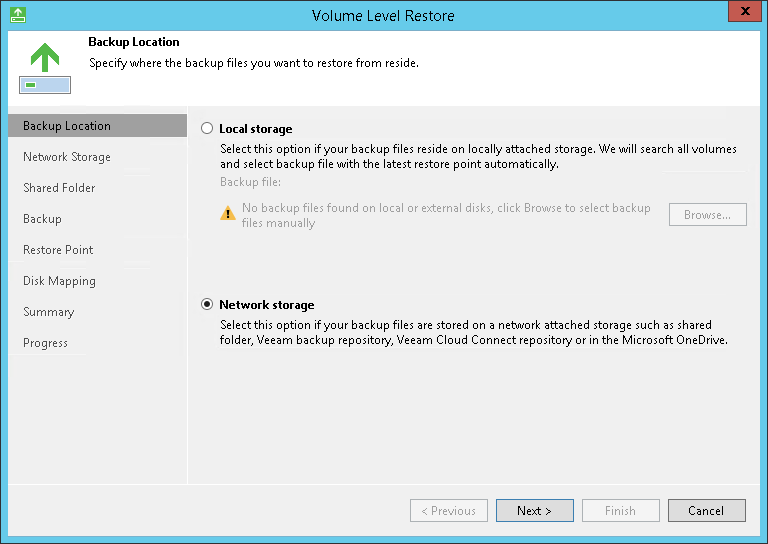 At the Backup Location step of the wizard, specify where the backup file that you plan to use for restore resides. Local storage — select this option if the backup file resides on the computer drive, external drive or removable storage device that is currently connected to your computer. Click Browse and select a backup metadata file (VBM). Network storage — select this option if the backup file resides in a network shared folder, in a Microsoft OneDrive cloud storage, on a backup repository managed by a Veeam backup server or on a cloud repository exposed to you by a Veeam Cloud Connect service provider. In this case, the Volume Level Restore wizard will include additional steps for specifying file location settings.